This Lasagna Soup is a longtime family recipe, it‘s savory and perfect on a cold winter day. A classic blend of rich lasagna flavors, in a luscious broth. We use homemade lasagna noodles because they are so damn good! Easy to make and you can get our fresh egg yolk pasta recipe here. But if time is limited, grab a box of Farfalle or Mafalda while you’re at the grocery store. Tip: Toss Parmesan cheese rinds into your freezer to add deep umami taste to dishes. These rinds are a key ingredient in several of our dishes including this amazing soup and our homemade red wine pasta sauce. 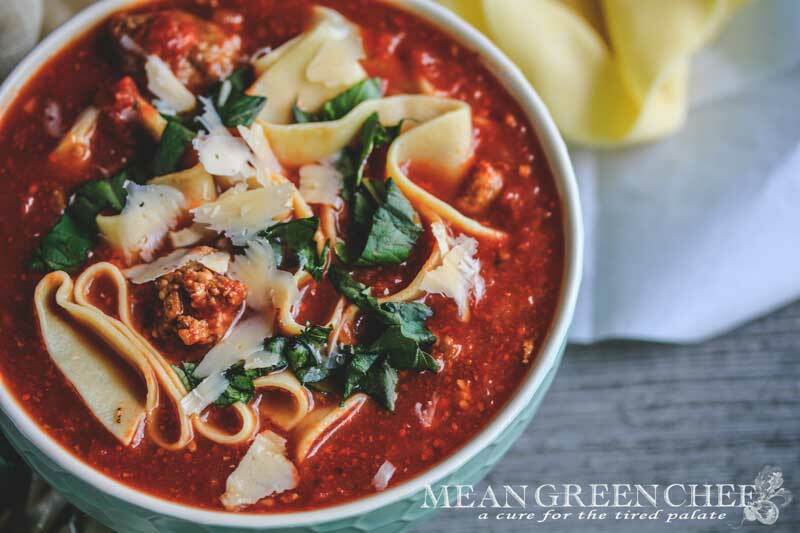 The stock for this lasagna soup is a robust tomato base fused with fresh herbs, a blend of sweet and hot Italian sausage, cheese and a touch of cream if desired. It shines as the flavors blend and a heady aroma fills the kitchen with the personality of a freshly baked lasagna. That first spoonful piled high with fresh tender noodles, tomatoes, sausage, and a mouth-watering broth will have you hooked! There are several steps that will help you build flavor in any soup you make. Sear the Meat: A crucial step in building flavor, often done in batches, using a fiery hot pan. Creating a dark crust that develops a deep savory flavor component. Lay your meat in the hot pan and allow them to sizzle for at least 5 minutes before flipping, when the bottoms have a dark crust and come away easily from the pan then you can flip to the other sides. Sweat the Vegetables: A technique that uses mild heat to soften vegetables and gently draw out their best flavor. Often referred to as aromatics, carrots, celery, onions, shallots and garlic benefit from sweating. Not caramelizing or browning, rather unlocking delicate aromas and breaking down the hard cell walls of these vegetables. Season every Step of the Way: Adding salt as you cook is imperative to achieve full flavor. Season at every stage of the process! Leaving seasoning till the end of the process will leave a dish flat. Season meat before searing, add salt while sweating your vegetables and remember to taste as you go. Adjusting for flavor as you go allows you to create a bevy of flavors you never thought possible. Skip store-bought stock and develop a layering of flavors with items you already have in your pantry and freezer! Herbs and other spices of your choice, a few that we always have on hand. Kosher salt, peppercorns, bay leaves, fennel seed, parsley, and thyme. These ingredients can be adjusted to what you have on hand and the flavors you want to achieve. Add them to the process of building flavor and you are on your way to a rich and savory soup. This Lasagna Soup is a family recipe, it’s savory and perfect any day of the year. A classic blend of rich lasagna flavors, in a luscious broth. Heat 1 tablespoon olive oil in a large Dutch oven or heavy-bottomed pot over medium-high heat. Add the sausage sprinkle with a dash of kosher salt and brown until crusty bits form on the bottom of the pan. Remove from the Dutch oven and allow to drain on paper towels. Reduce the heat, then cook the onion until softened about 5 minutes. Toss in the garlic, oregano, and tomato paste, stir until darkened and fragrant, about 3 minutes. Combine the browned sausage back to the pot. Stir until well blended, taste for flavor. Add more Kosher Sea Salt if necessary. Pour in the chicken broth, crushed tomatoes, and 2 cup water; increase heat and bring to a slow boil. Stir, reduce the heat, cover and simmer for 1 hour, stirring occasionally. Uncover, stir, and simmer for an additional 20 minutes, slightly reducing the soup. Check for flavor balance. Bring a pot of salted water to a boil and cook lasagna noodles per directions. Drain, and toss with a drizzle of olive oil. Mix in the noodles, basil, parmesan, and heavy cream; simmer 2 more minutes. Topped with fresh basil and parmesan. To heat soup bowls, place oven-safe bowls into 200°F/93° for 5 minutes. Soup will stay fresh in the fridge 3-4 days and in the freezer up to 6 months. If storing in the freezer we recommend not adding the lasagna noodles until reheating. We hope you love this soup as much as our family and friends do. Serve alongside warm crusty bread slathered with butter and Oven Roasted Garlic. Take a minute to check out our Easy Hearty Vegetable Soup! This looks amazing! I love soups, so I will be trying this soon. Pinned it, too! I seriously have never heard of Lasagna Soup but wow it looks and sounds amazing! This look so good! Soups are perfect this time of year! I have never heard of this soup which is surprising but it sounds delicious. Looks easy too which is a huge plus in my book. Looks so good! My fiance and I love making our own broth. It adds so much extra flavor! Hi Katie! 🙂 It’s the best way to build great flavor, and it’s so darn easy too. Well worth the extra effort! I love the tips of how to add flavor to soups – thanks for the extra tips! This looks magnificent! What a perfect soup to make as the cooler weather sets in. Yum! This looks so good as no easy! My whole family would love this. I’m excited to try your noodle recipe too! This looks delicious. How well does it freeze? I make my husband lunches when he’s out of town and he would love this. This looks delicious! And the extra tips on making your own broth are appreciated! This looks like a delicious recipe we need to try. I love soups in the fall/winter. I had never heard of a lasagna soup, but I love all things Italian! I find it so much easier to think of meals for my family in cold weather because soup is always a good choice. This one looks great! Thanks, Erin! 🙂 this is the perfect fall soup recipe. We miss the cold weather, still near 90° here in SW Florida, to darn hot. Please be sure to tag us @meangreenchef or #meangreenchef! Wow, this looks delicious! I love the extra tips about building the flavors and sweating the vegetables! This looks so delicious! I agree with you about avoiding store bought broths! I love making my own bone broth for my soup bases. I have never eaten lasagna soup, but this looks delicious! I will need to try this on the coming winter months. This looks delicious! Does it work well as leftovers? Hi Arianny, thank you! Great question! This soup stays fresh in the fridge 3-4 days and in the freezer up to 6 months. I love lasagna… totally making this sometime! This looks absolutely delicious. I love lasagna and I like the idea of finding it’s flavors in a soup. This is such an amazing idea!!! 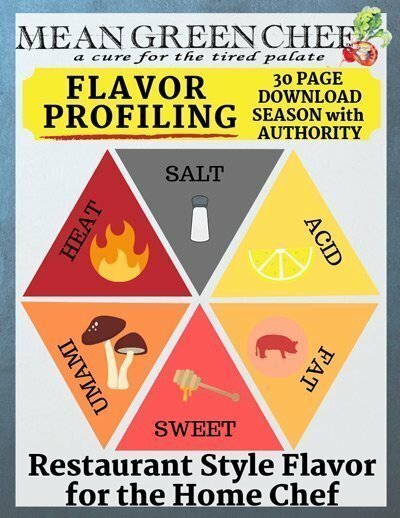 I love the section on building flavor. It is so important with soup! This soup looks so good! I need to try this and also the homemade stock. Love that. Thanks for sharing. It’s finally starting to feel like fall here. I’m ready for all the comfort food, especially yummy soups. This sounds fantastic! This sounds delicious! And I love your tips for developing flavor. This soup looks so good! I can’t eat the Lasagna noodles but would substitute for them. We love soups! Thanks for sharing! Hi Rosanna, thank you! 🙂 Actually, this soup still tastes amazing even without the noodles! Wow, this sounds so good! I’ve never heard of lasagna soup, but you certainly make me want to try it! I LOVE lasagne! This is such a cool recipe. Definitely 5-stars! I love lasagna! I will need to try this recipe!! This looks like a great soup for a cold winter’s day! Can’t wait to try it!